In this seven part series, I will discuss how to structure a typical practice session. This will offer a solid guideline for what things should be a part of every practice session and how much time to spend on each element. In future blog posts, I will explain each item in detail. Before we get into the details, let’s take a look at the basic structure and parts of a productive practice session. Let’s think of a practice session like a chest of drawers. Each drawer is a different size, relative to the time you will spend on that element. We begin at the top and work our way down. As we open each drawer, we find sheet music inside. The first drawer is thin and contains a notebook and ideas for tone exercises. Drawer #2 is a little bit larger and is full of little technical exercises and note cards with scales on them. Drawer #3 is just a little bit bigger still and when you open it, you see books of etudes. We’ll open up the drawers and examine each of their contents in future blog posts, but for now let’s consider what the dresser looks like from the outside. The dresser has six drawers of various sizes. The size of the drawer represents the approximate time for the material in it. 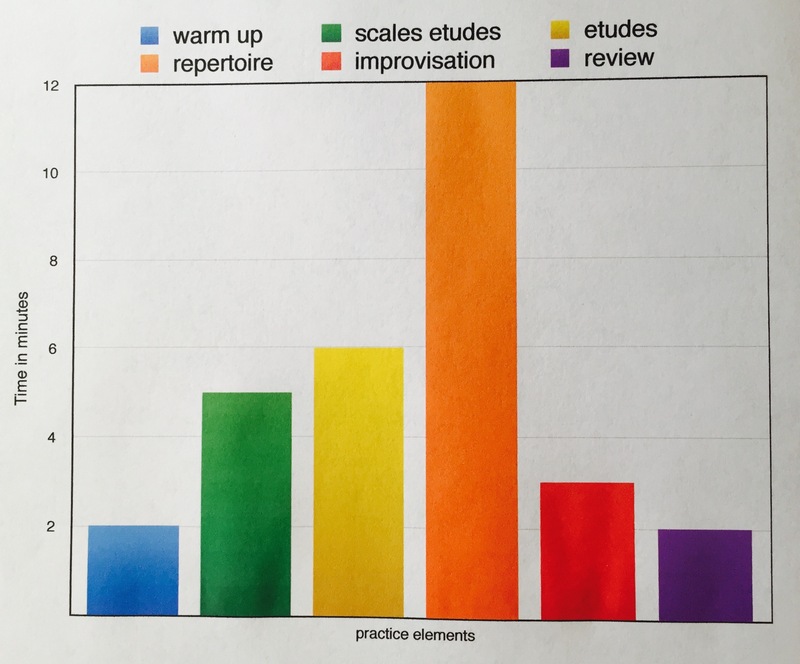 The bar chart makes it easy to see that the repertoire work comes in the middle of the practice session, after the brain and body are warmed up but before fatigue sets in. This is the optimal place for hard work. By the way, this bar chart looks like the workout program on a treadmill. Practicing isn’t much different than athletic training! If you have other items to practice (orchestral excerpts, extended techniques, etc. ), find the closest category and include them. I’ll give more ideas for things to include in the six basic categories in future blog posts. 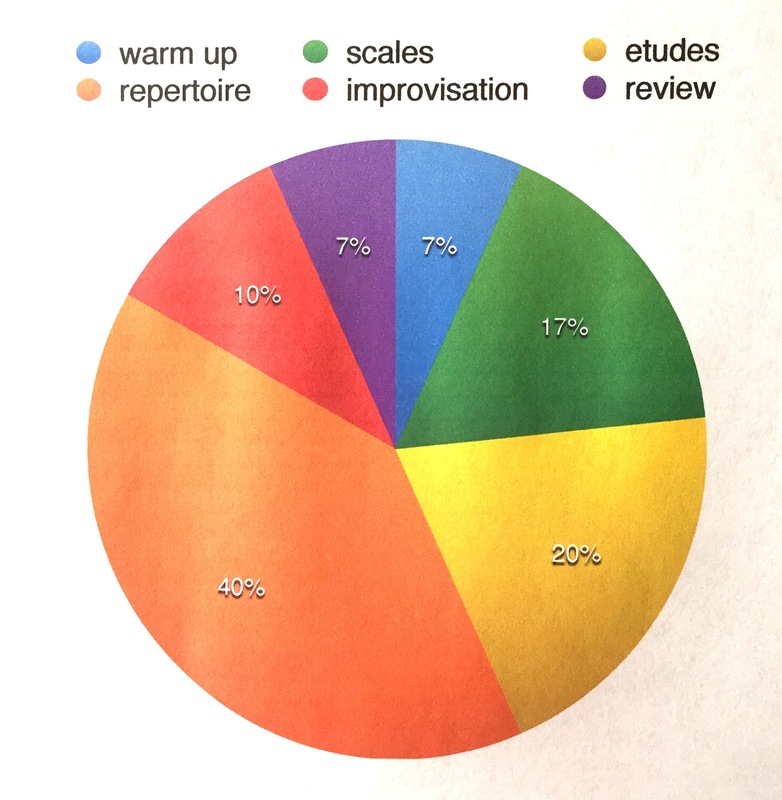 As you move closer to a performance or competition, you may need to devote more time to the repertoire and less time to repertoire. These guidelines are intended to be flexible suggestions. However, they offer a way to structure the practice session in a careful way so that nothing gets overlooked. 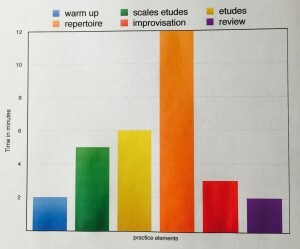 If you practice for longer than 30 minutes, you may want to consider breaking your practice into several shorter sessions. After every 30 minutes of playing, you will want to take a short break. Stand up and walk around the room, get a drink of water, stretch. The brain can only handle short bouts of concentrated activity before becoming worn out. Additionally, spacing out your practice helps long term memory. The blog post How We Learn talks more about this phenomenon. Two thirty minute practice sessions with a break in between is better for learning than one un-interrupted hour.